On Sunday, October 16, 2016 we had the pleasure of visiting what has been ranked the third best Presidential-themed attraction in the nation by USA TODAY. Considered a must-see for any visitor or resident of Music City – The Hermitage is a historical plantation and museum – located in Davidson County, Tennessee, about 10 miles east of downtown Nashville. The plantation was built and owned by Andrew Jackson, the seventh President of the United States, from 1804 until his death on the property in 1845. 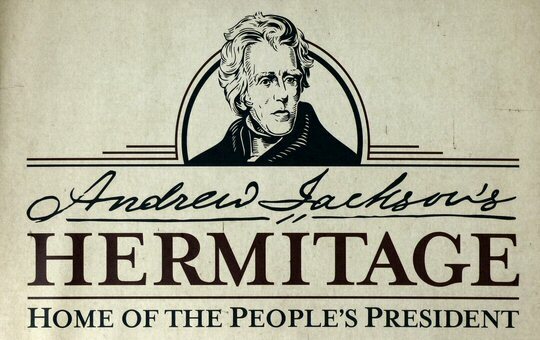 Since opening in 1889, President Andrew Jackson’s Hermitage has welcomed over 15 million guests. Located only minutes from the bustling and more modern by the day downtown – this National Historic Site consists of 1120 gorgeous acres of family fun for all ages – and offers a glimpse into how the region functioned over 150 years ago. Guests are welcome to step back in time and explore the grounds, Hermitage Mansion, the first Hermitage, gardens, museum, enslaved memorials and much more in a wholly historical setting. As we approached the mansion the first thing that caught our eye was the cedar-lined, guitar-shaped carriage drive, designed by Ralph E. W. Earl. Back in the day these unique contours made it easier to maneuver carriages in the narrow space. Our first destination was the lovely gardens off to the right of the building that were still in bloom on this Fall day. As we strolled the carefully manicured paths we encountered the tomb of Andrew Jackson and the Jackson family plot occupied by close friends and relatives of the First Family. 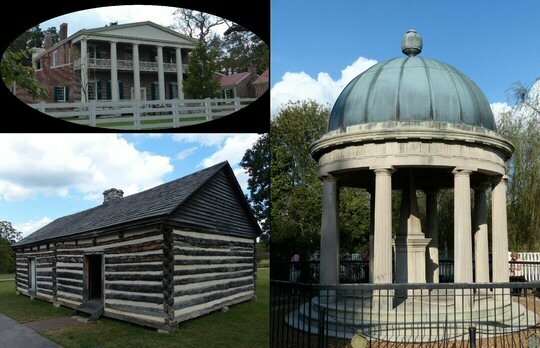 The mansion, worker’s quarters and the tomb of Andrew Jackson. One grave marked the final resting place of Alfred Jackson who was born into slavery around 1812. Later he worked at the Hermitage as a freeman after Emancipation. Alfred stayed on as a caretaker following the purchase of the estate in 1889 by the Ladies’ Hermitage Association. Alfred died in 1901 and was buried near the tomb of the President and his wife. Later we would visit Alfred’s Cabin that maintained a position of prominence near the President’s residence. Next we boarded a horse drawn wagon for a special tour that gave us a greater understanding of the scope of Jackson’s 1000-acre cotton plantation. Our driver told stories as we discovered the First Hermitage – the much smaller dwelling that the Jackson family lived in for 17 years before taking occupancy of their opulent mansion home. We then traveled to the site of the Cotton Gin and Press which had the impact of increasing the need for labor on the farm as Ely Whitney’s machine allowed for a much greater yield from the controversial crop. The Field Quarter and several archaeological sites associated with slavery and farming rounded out the pleasant forty-five minute ride through time. Following our tour of the grounds that was enhanced with an audio component that imparted facts and information about the remnants, ruins and restorations on display we headed to a fast moving line that would take us inside the mansion for a 20-minute guided tour of the former home of The People’s President. We quickly learned that Old Hickory had good taste as the two floors of the impressive dwelling were adorned with stunning floor to ceiling wallpaper imported from Europe. We saw bedrooms and guest quarters where dignitaries as diverse as President James Monroe, Aaron Burr and Marquis de Lafayette had stayed. 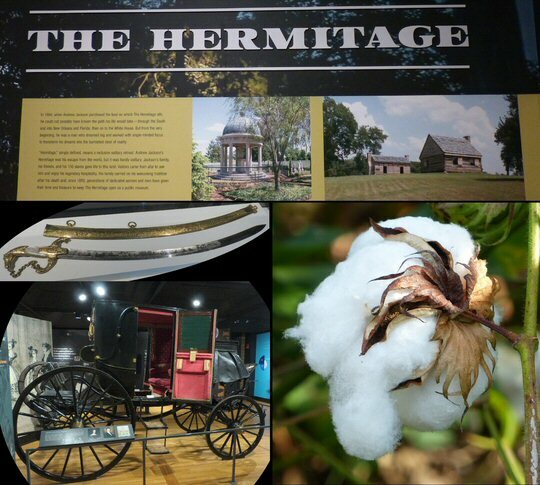 Andrew Jackson artifacts and picking cotton are part of The Hermitage experience. Finally, we enjoyed Andrew Jackson: Born for a Storm – a state-of-the-art, 1.1 million dollar exhibit bringing the rich story of Andrew Jackson’s meteoric rise from his humble beginnings to his presidency through bold visuals and a series of interactive displays. The exhibit focuses on the three pivotal stages of Jackson’s astonishing life: his modest origins as an orphan, his resiliency as a General and his visionary leadership as a President. Artifacts included Jackson’s Presidential carriage and signature clothing. Located at 4580 Rachel’s Lane in Nashville, Tennessee The Hermitage is open year round. In addition to on-going house and ground tours the Hermitage hosts many additional special events. Appropriately for October this month will feature an exclusive lantern tour in the evenings for those who like a little fright in the night. Learn about the ghostly events of the Battle of New Orleans, Andrew Jackson and the Bell Witch on this chilling excursion. The 16th Annual Hauntings at the Hermitage will take place on October 22 from 4:00 p.m. – 10:00 p.m. 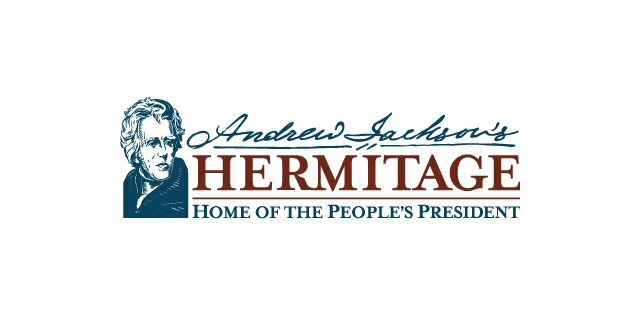 The busy season will conclude with The Hermitage Gala that is the Andrew Jackson Foundation’s premier fundraising event on October 28. 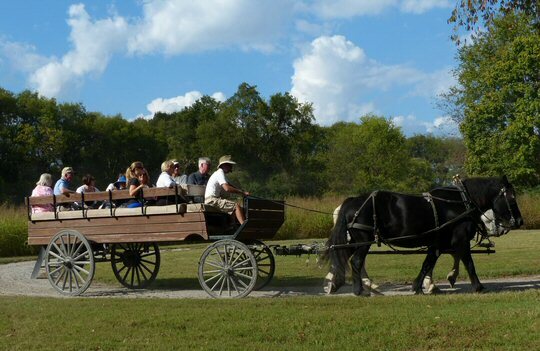 The Hermitage By Wagon Tour offers a deeper glimpse into plantation life.